Born the illegitimate son of a priest and a physician’s daughter, Desiderius Erasmus entered the world on October 28, 1466 in Rotterdam. He was the most influential and well-known humanist of the Northern Renaissance and the undisputed pied piper of the intellectual community. 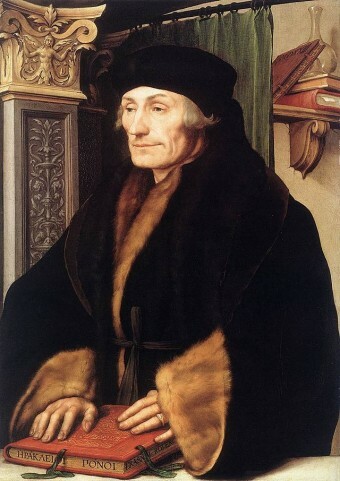 Erasmus was courted by kings, prelates, and scholars who hoped to enhance their own reputations by basking in his reflected glory. From his earliest days, young Erasmus showed aptitude as a scholar. In 1487, he entered an Augustine monastery and was ordained as a Catholic priest in 1492. Later that same year, the Bishop of Cambrai hired Erasmus as his secretary. The Bishop quickly recognized his extraordinary intellectual gifts, and he sent Erasmus to the University of Paris in 1495. Erasmus found his way to England in 1499 and established several life-long friendships with John Colet, John Fisher and Thomas More. English humanists were attempting to bring about needed reforms in the Church, and were studying Scripture for guidance. These prelates and scholars – and their mission – would drastically alter Erasmus’ life. He continued traveling through Europe as an independent (and usually impoverished) scholar. He spent his time writing on both secular and theological subjects, his work a vehicle for both his brilliance and his wit. Recognizing that the knowledge of Greek was indispensable to his scholarly pursuits, he mastered the language while in Italy. Erasmus also hooked up with a printing house in Venice, Aldus Manutius, that agreed to publish his writing. He was one of the first authors to have their work mass produced, and this allowed him to be professionally and financially secure in an era when most artists depended on the whims of wealthy patrons. By 1509, Erasmus was back in England. He wrote The Praise of Folly, an indictment of the Church’s weaknesses and the obstacles standing in the way of Christ’s teachings, which he dedicated to his good friend Thomas More. But his most influential work was the Greek/Latin interpretation of the New Testament he completed in 1516. They were immediately translated into the languages of the common European peoples, which was fine by Erasmus, but a huge sticking point with the Catholic Church. Soon after, Martin Luther and other burgeoning Protestants were pressuring Erasmus to pick a side, something he could not and would not do, partisanship not being part of his nature. Erasmus was in agreement with Luther on many major points, but always made clear his issues with the Catholic Church were those of practice, not of doctrine. But it was easy to see why Luther would want to win Erasmus over to his side, and why the Church would want to hold on to him, even though his criticisms stung deeply. Erasmus was about reform, not revolt. As a result, when Erasmus neared the end of his life, he found himself alienated from both the Lutherans and the Catholic Church. He still advocated religious toleration “because in this way the truth, which is often lost amidst too much wrangling may be more surely perceived” and didn’t believe in the death penalty in most cases as “It is better to cure a sick man than to kill him.” Both sides craved his seal of approval, but neither wanted to follow his advice. He died on July 12, 1536. There is no such thing as an “Augustine monastery.” It was an AUGUSTINIAN monastery — i.e., a monastery housing men who followed the rule and spirituality of St. Augustine of Hippo. This language will falsely imply to some readers that (1) the Catholic Church needed to have some of her teachings changed and that (2) the Church had not been “studying Scripture for guidance” until then! (2) The Church (members of which WROTE the New Testament) has ALWAYS studied the Scriptures and always will. This reference to a “huge sticking point” is absolute nonsense! The Church has NEVER been against scholars translating from the ancient languages into local tongues. The most famous example — from several hundred years before Father Erasmus — is that of St. Bede the Venerable, who translated parts of Scripture into the early form of English of his time. Contrary to what anti-Catholics would have the public believe, DOZENS of vernacular translations of the Bible existed before the year 1500. The only problems that sometimes arose were those caused by FAULTY translations (e.g., that of William Tyndale), by which incorrect teachings were dispersed.